Join us on Monday, Nov. 19 at the Manchester Downtown Hotel to kick off the 2018 Santa Fund season. Individual tickets are $45 or get a table for 10 for $425. Money raised supports the Salvation Army's annual effort to help families in need during the holiday season. Contribute to the Santa Fund by clicking "Donate" below, mailing a check or dropping off a donation. Fill out the form from the newspaper and drop it and your donation in the Santa Fund box at the Union Leader, 100 William Loeb Drive, Manchester, between 8 a.m. and 5 p.m., Monday through Friday. * The New Hampshire Union Leader is responsible for the fundraising and the administration of the Santa Fund. The Salvation Army in Manchester makes all of the decisions (through an application process) regarding assistance to qualified families. Please direct all calls regarding assistance to the Salvation Army at 627-7013. 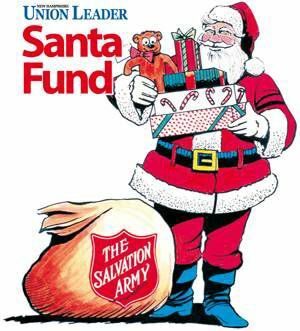 For 60 years, The Union Leader Santa Fund has supported The Salvation Army. Santa Fund dollars provide warm clothing, meals and toys for local families during the holidays, as well as support Kids’ Café, summer camps and other critical programs and community services. In its first year, the Santa Fund brought in $1,000 to support The Salvation Army’s Christmas efforts. Since then, nearly $7.9 million has been raised thanks to the generosity of local businesses and individuals.